As a farmer, you'll naturally want to grow crops in the fields that nobody remembers. 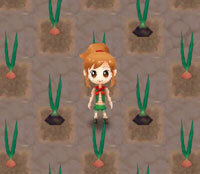 When harvesting your crops you may discover that a different type of crop appears among the seeds that you planted. These are special crop mutations that will grow if the seeds and season are correct for them to appear. There are a total of 155 crops that you can grow in the game. This includes the field plants, tree fruit, and even the wild Bamboo Shoots and Mushrooms you can pick up off the ground in the Mountain area. The Collected list counts the normal and Great versions as separate entries, so technically there are 72 field crops (144 total), 4 fruit trees (8 total), 1 Grass crop, and 2 wild crops (as there aren't Great versions of these). You can keep track of the number you've discovered by going into your farmhouse bookshelf, select the Encyclopedia, and then select the list of Collected crops. Anything that has a vegetable icon next to its name is part of the crop category. These crop mutations are the same as those in Harvest Moon: The Lost Valley. To trigger a crop mutation, you simply have to plant the crop seeds in the appropriate season. You will need to water the crops once per day just to get them to grow, but adding fertilizer will help to increase the chances of the mutations appearing. 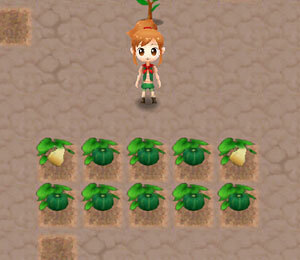 You can buy fertilizer from Iris' flower shop in Chestnut Town. Selling a certain number of mutations, either via the shipping bin or to Sam, will add that crop's seeds to Sam's shop inventory. Some mutations don't require a lot of sales to unlock the seeds, while others require a lot more. Crops will grow in any season, but Great-quality crops will grow from the seeds when planted in their preferred season. You will earn more money from selling Great crops than the normal versions. Selling a lot of Great crops won't unlock Great-quality seeds at Sam's shop; it's just for more profit. Adding fertilizer from Iris' Florist will help with Great development. Even though it might not create Great quality if it matures beyond its preferred season, it still can mutate upon maturity in its current season. Basically, planting a crop early before its mutation season will mean it can mutate when it matures. For example, plant Celery in late Spring (24th or later) and it may mutate into Mystic Herb when it finally matures in Summer. The crop doesn't need to be planted in the season it mutates in; it just needs to ripen when in that season. Mutating a Petite Onion into a Pearl Onion requires you to plant the seeds in a specific pattern, which isn't explained anywhere in the game. You will need to plant the seeds in a checkerboard pattern with a space between each Petite Onion seed. You do not need to add any special fertilizer to trigger the mutation into Pearl Onion. The description for Pink Spinach says that it grows "in swampy areas in fall," but it actually prefers Winter season.